“Only 5 more sheets, boys!” Funny laundry duty RPPC. Private Collection. Atta girl! 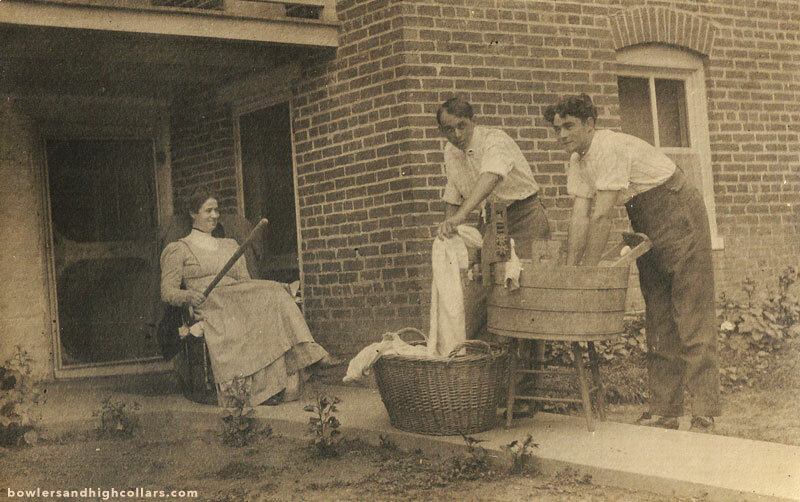 This photograph of a grinning lady sitting down on a rocking chair with a baseball bat at the ready, and with her eyes on the two men of the house doing the laundry! Too much! Now let’s take a moment to appreciate how good we have it today with the wonderful invention that is the laundry machine. And men do more house shores today than they ever did before (yet somehow it’s still a challenge to get dear husband to help folding clothes). This entry was posted on Friday, May 15th, 2015 at 10:29 am	and tagged with 1900s-1910s, edwardian, Funny, gender roles, laundry and posted in Humorous, RPPCs. You can follow any responses to this entry through the RSS 2.0 feed. Ha! They probably did this once a year lol, “poor chaps” hmph! Hahaha! Sure! The maid will do it if you can afford her! Well, no, no adult size diapers lol!